I’m spacing out while staring at these wasabi peas, which people love, and I don’t get. They’re just dried peas covered in horseradish oil applied with some kind of space-age polymer. So I get to thinking: fresh horseradish is a great ingredient, it has a great flavor. (It’s also cheap and lasts forever.) That was it: peas with horseradish. Done. We made it and added radishes for crunch and texture and color. It looked easy, I had all the ingredients, so it was time to cook. 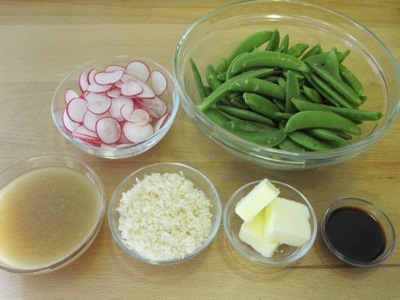 I prepped a pound of the peas by pulling off the strings, sliced three radishes into paper-thin discs on a mandoline, grated a quarter cup of fresh horseradish, measured out a half cup of ramen broth, three tablespoons of butter, and a tablespoon of light soy sauce. I brought the broth to a boil in a skillet over high heat. The recipe calls for a cup of broth that is reduced by half in the pan, but since I concentrated my ramen broth to double strength for storage, all I had to do was heat it. While the broth cooked, I tossed the radish slices with a pinch of salt. I added the peas and stirred frequently until they were bright green, about three minutes. 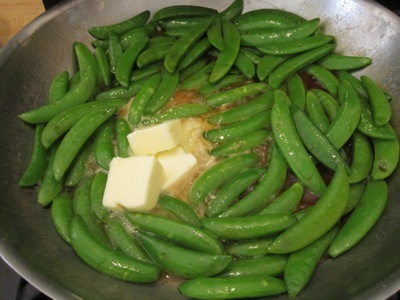 I added the soy, turned the heat down to medium, added the butter, and spooned the pan juices over the peas until they were glazed. I added the radishes and a few grinds of black pepper, gave everything a stir, spooned into bowls, and scattered the horseradish over the peas. The peas had all of the tastes and textures of their snack food equivalent: sweet, salty, and crunchy, with the sinus-clearing bite of horseradish. 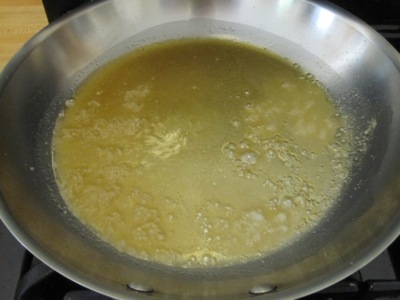 The real surprise, however, was the sauce: the reduction of soy, broth, and butter added unexpected depth to the dish. 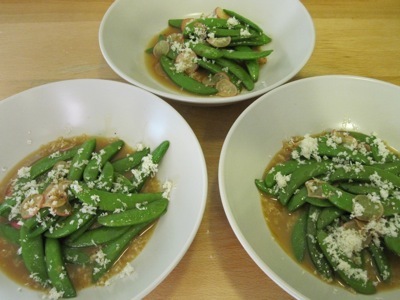 I plan on using that reduction for other vegetables, in particular the batch of broad beans in the fridge. The radishes lost their color but not their crunch in the quick stir, so the next time I’ll add them to the peas during plating. If these last few recipes haven’t convinced you to make some ramen broth, I urge you to do so. It’s become an indispensable ingredient in my fridge, rapidly replacing the omnipresent chicken stock in many of my standard recipes. This entry was posted in food & cooking and tagged cooking, food. Bookmark the permalink.